Does storing clothes in a camper drive anyone else a little crazy?? Seriously, the motorhome manufacturer states the van is for 6 people… but you can't hang 6 coats up in the wardrobe, let alone any other clothes! 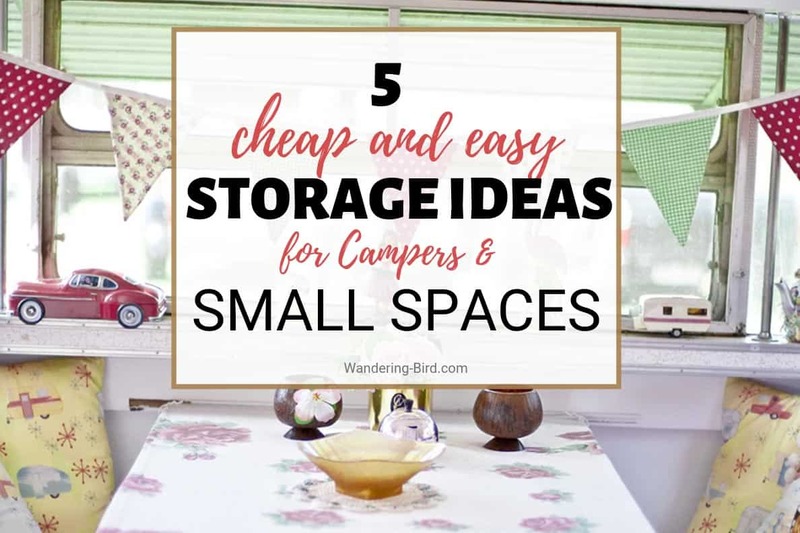 I love finding storage ideas for small campers- but clothes became one of my personal challenges!! Motorhome clothes organisation ideas- Put storage on back of the wardrobe door- and any door! Trying to pack our clothes for long-term motorhome travel was tough- and sadly the main problem was me. I had far too many clothes and there just wasn't enough room to store them all! I know, I know- after 14 years of living on boats I should be REALLY good at living minimally… but I seem to be getting worse as I get older. Or maybe I got worse when I had more money to spend- and now I'm reluctant to give it all up!! To make matters worse, every single one of those outfits requires different shoes! And that's before we even get started on Mr WB's clothes…!!! Weirdly, I can travel light no problem. 2 weeks with only hand luggage is perfectly doable for me. But for some reason this didn't work in the motorhome- it's still a work in progress to be honest! Here are 5 of our favourites! This is one of my favourite ideas- and it's so simple. Just remove the stuffing pad from a cushion and put soft clothes which you don't need to keep flat inside. We have 4 cushions in the motorhome. I use two for warm snuggle blankets, one for winter gear such as hats, scarves and gloves and one for gym gear and tights. We haven't gone as far as getting rid of our pillows yet… but I guess you could! TOP TIP- pack the cushion quite tightly so it keeps its shape. Nothing worse than a saggy cushion. Also, try to get a cushion with a zip on the back- you don't want things falling out if someone moves it!! Mesh bags are brilliant because you can see into them, and they fit into any space available. They're also a great way to keep underwear and socks together and not falling about inside the cupboard. We have a big laundry bag, so we use the mesh ones for clean clothes. Easy peasy to keep it all neat and orderly. Boes are perfect for storing bulky things jumpers, t-shirts and jeans, which take up a lot of room inside a small cupboard. We try to stack things ‘on end' so you can easily see what's in the box. We like to keep our boxes removable, so we can pull them out to see the contents, but you can always put a screw through the bottom into the wardrobe base to keep it in place. We also use canvas boxed instead of plastic- it stops rattles in your motorhome. I also LOVE these storage boxes- they would fit great in our wardrobe and handy for coats or things we don't use often. The open-ended one for jumpers is genius! This is a simple idea which we've used in the boat for years. We've tried a selection of these over the years and my favourites are the ones without zips… because I'm lazy and I never zipped them up anyway! If you want to be REALLY organised, get some large elastic bands and secure the shoes together in pairs so they're easy to find! For this, I do recommend an easy to clean, plastic box. We love the trolley because we can use it if we need to transport something heavy, which is why we got one with wheels. But a normal plastic box will work for shoe storage too. TOP TIP- DO NOT PUT CLOTHES AWAY WET- it causes damp and condensation (Here are 12 easy tips to reduce condensation in your van.) We hang them in our bathroom to dry first. If you don't have a bathroom, hang some elastic over the front cab or any place you're not using and let things dry there. There are 3 of us. We have two shoes racks in our wardrobe and we have all our clothes in there. Our coats go on a coat rack in the wardrobe. We have a shoe cupboard but it’s max of 3 pairs each (me and hubby have boots, trainers and jandals, my daughter had boots and jandals). We all have big feet too. Our ski kit goes in packing cubes under one of the seats.